You can add a timer control to the Case form to help customer service representatives gauge the amount of time they have to complete a task—typically associated with a service level agreement (SLA). The timer control initially displays a count-down timer to show the time remaining to complete the task. If the CSR completes the task within the time remaining, the control shows the word Succeeded. If the CSR doesn’t complete the task within the time remaining, the control shows the word Expired. As the timer counts down, the color changes to yellow as the time remaining nears non-compliance. If the time remaining expires, the timer shows the word Expired. Then the timer color changes to red and the timer starts counting up to show the elapsed time since the task should have been completed. This behavior is optional. If a condition causes the milestone to be canceled, the control shows the word Canceled. This behavior is optional. If either of the required fields in the Timer Control dialog box do not have a value in the record, the control shows the words Not Set. In the solution explorer, in the left navigation pane, expand Entities, expand the Case entity, choose Forms, and then open the Case form. Choose on the form where you want to place the control. You can add it anywhere except the form header or footer. 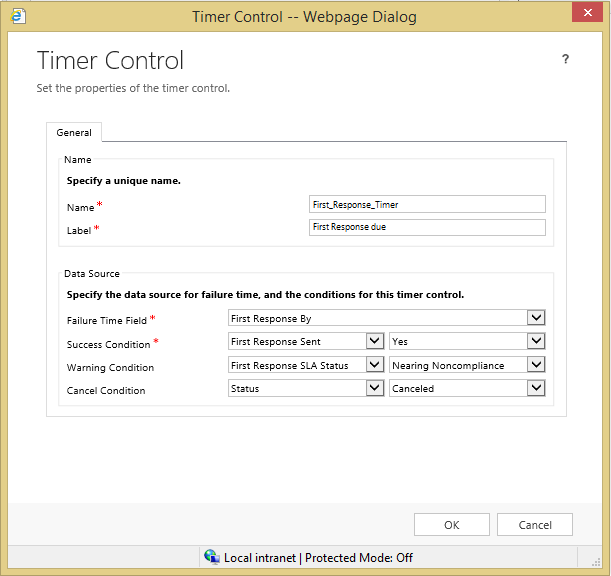 On the Insert tab, in the Control group, choose Timer. In the General section, enter a name and label for the control. Under Data Source, next to Failure Time Field, select the date-time field that represents the time when a milestone should be completed. For example, select the First Response By field. Next to Success Condition, select a field to use to evaluate the success of the milestone, and then choose the condition that indicates success. For example, select the First Response Sent field, and then select Yes to indicate the success criteria of the First Response metric. This setting is required. Next to Warning Condition, enter the condition that will cause the timer control to display a warning when the time is about to expire. For example, in the first list next to Warning Condition, select First Response SLA Status. In the list to the right, select Nearing Noncompliance. This setting is optional. Next to Cancel Condition, select a field to evaluate whether the achievement of the milestone should be canceled. Then choose the option that indicates the milestone is canceled. This setting is optional. 8. Choose OK to add the control to the form. The timer control refreshes on the OnChange form event, and also when the form is loaded. You can add a timer control to a form based on any record type (entity), including custom record types. You can add multiple timer controls for different key performance indicators (KPIs). You can add a timer control to any Main form, but timer controls are not displayed in Microsoft Dynamics CRM for tablets.